Preparing kids for swimming lessons on their first dip is a great idea. Young children can often be a bit nervous about starting something new. The thought of meeting new people or being in a new place is not always easy. For parents, even more so for new parents, this might feel like a daunting experience too. The checklist below will help in preparing kids for swimming. It can help to ensure that both you and your child are ready to get down to the pool and into the first lesson feeling confident you are fully prepared. Help your child get used to being in water. The best way of doing this is in the bath. Sing songs that they know and play games with floating toys which will help to put them at ease and make the idea of being in water fun. When you go to choose a swimming costume, let your child help you pick for them. Tell them why they will be wearing it and get them to try it on with a swim nappy (if needed). You could even do this in the bath so they get used to the feeling of the costume when it is wet. It may seem a small thing but helps in preparing kids for swimming lessons. Take your child down to the pool before the first lesson. Take them around and play some games, I spy is a good choice. This lets them get used to a new place so they are not shocked when their first lesson comes around. If you can, meet with the swimming teacher so your child will remember them at the first lesson. This might not always be possible, but some pools do offer this to help new or nervous swimmers. Double check the date and time well in advance. You want to give yourself a little extra time to get to the pool and get changed. Being rushed will only get you and your child flustered. Make sure you let the pool know about any medical conditions, injuries or special needs your child might have before the lesson. Make sure your child has had something to eat in advance of their lesson, but don’t give them a huge meal. Just a light snack to help maintain energy levels. Some dried fruit or nuts is a good choice. 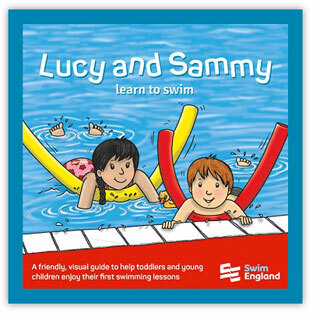 Swim England has created a special story book which helps toddlers and young children to get ready for their first swimming lessons. Parents and carers can use it to show children what the first steps of learning to swim are like. It is a great way to show how much fun they can have in water from an early age. The perfect introduction for toddlers and young children to the learn to swim environment. Buy your copy in the Swim England Shop. Only £2.50. Shares the importance of swimming skills through colourful, friendly animal characters. Buy your copy today in the Swim England Shop. Only £2.50. 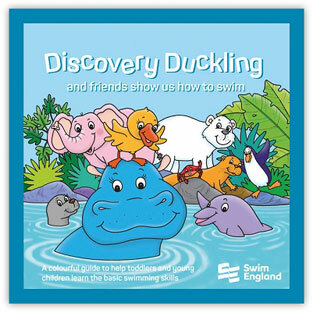 You can also use the book to record and celebrate the progress your child is making on their learn to swim journey. The book is designed to be used alongside the Swim England Learn to Swim Pathway. It has space for recording their achievement of Swim England Discovery Duckling Awards and Duckling Awards. There is also another story book which gives a fun introduction to the basic swimming skills. Buy these books directly from the Swim England Shop here or ask the centre who provides the lessons or your swimming teacher.